St Therese of Lissieux is a popular saint among young women because of the way she devoted her life to prayer. Her surname was Martin. She entered the convent at 15 and because of her age had to get special permission to do so from the Pope. St Therese is sometimes called ‘the little flower’. In her actions St Therese demonstrated that with patience and determination all of us can live our dreams. St Therese overcame great adversity, in terms of her health, to live her life with integrity and honesty in close connection with God. 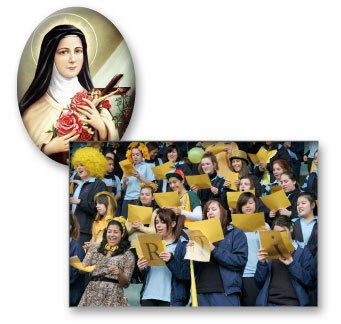 St Therese inspires the Martina House with her discipline and inner strength. She died when she was 22. 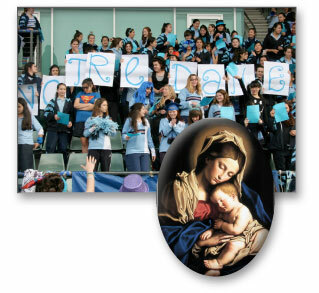 St. Therese is also one of Australia’s patron saints. This house is named after the foundress of the Presentation Sisters, Nano Nagle. Nano Nagle was a woman of great courage, discipline and strength. Nano Nagle did not let circumstances get in the way of her work. She used the resources available to her to achieve her work educating the poor, and when her resources were exhausted, she begged from other people the resources needed to carry on. Nano Nagle is an inspiration to the Nagle House because of her commitment to her community and her desire to bring people together in a common cause. Literally translated from the French, this means Our Lady, and refers to Mary, the mother of Jesus. The Presentation Sisters have a strong affiliation with France because this is where Nano Nagle first entered religious life, but also because the full title of the Presentation Sisters is Sisters of the Presentation of the Blessed Virgin Mary - thus the PBVM insignia worn by Presentation Sisters around the world. Our Lady overcame great hardships as a mother and showed compassion for others at all times. When Mary found out her cousin Elizabeth was pregnant she rushed to see her to offer her support. In this way, Mary demonstrated the need to support others and face all challenges with courage and self assuredness. Mary’s ability to put others first and sacrifice her needs for the needs of her community are an inspiration to the Notre Dame House. St Joan of Arc is the patron saint of the Parish of Haberfield to which Domremy is closely linked. 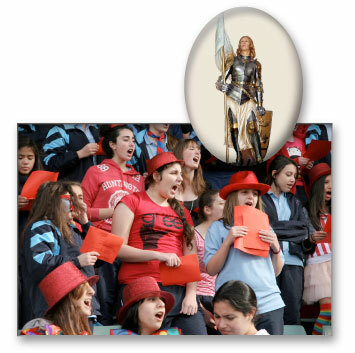 Orleans House has the privilege of having St Joan of Arc as their inspiration and guide. St Joan is renowned in history as a woman of incredible strength of character and determination. St Joan was a courageous young woman who at the age of seventeen set out on a mission to save France and succeeded in convincing the heir to the throne of France to give command of an army. On May 8, 1429, Joan led this French army into battle and defeated the English forces that had been besieging the city of Orleans. Joan thereafter was also known as the “Maid of Orleans”. Long the Patron Saint of France, Joan was canonized in 1920. 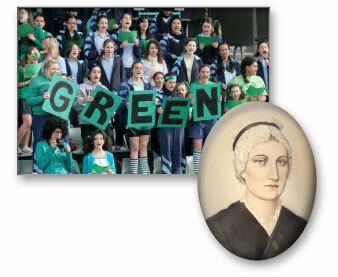 St Joan’s conviction and selflessness define the character that inspires the Orleans House.